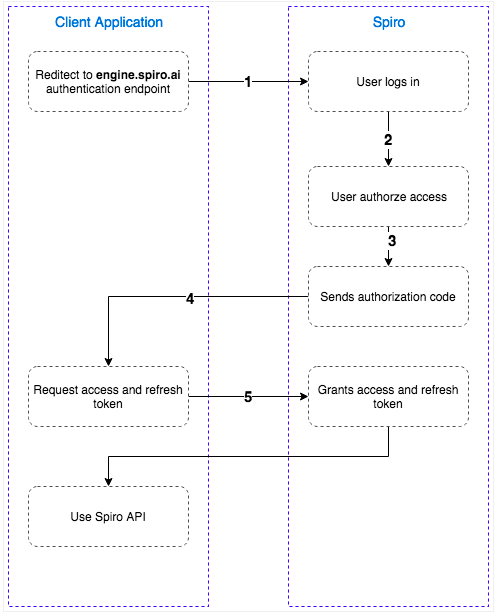 In order to use Spiro’s API, you must have a valid access token, provided by Spiro. To request a token, email support@spiro.ai with your request, and make sure to include a redirect URI (must be https/SSL). Spiro will send you a client ID, client secret, and authentication URL. Once you are there you have to sign in and authorize access. Each tab on the left-hand side of the API interface mirrors a class of features in Spiro. Under each class of features, there is a list of endpoints that can be used to retrieve, create, update, or delete data via HTTP request protocol. Clicking on the endpoint in the API interface opens a built-in test development environment which specifies the URI, request method (GET, POST, DELETE, or PUT), and parameters. Additionally, developers can actually call the resource example from the environment, and see an example request syntax and infrastructure in several programming languages. The API Reference can be found here.